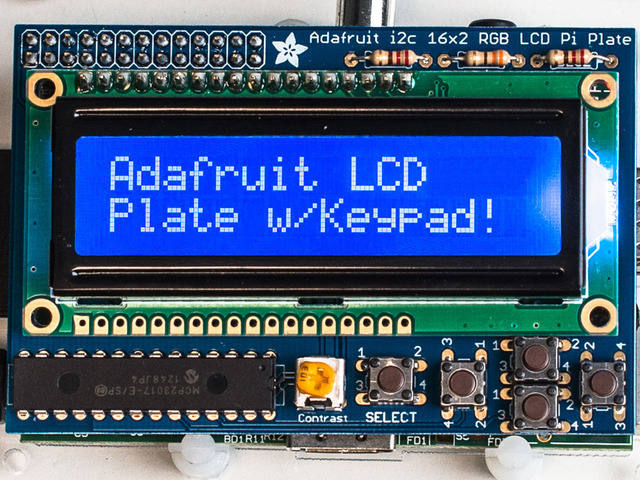 This new Adafruit plate makes it easy to use a 16x2 Character LCD. We really like the range of LCDs we stock in the shop, such as our classic blue & white as well as the fancy RGB negative and RGB positive. Unfortunately, these LCDs do require quite a few digital pins, 6 to control the LCD and then perhaps another 3 to control the RGB backlight for a total of 9 pins. That's nearly all the GPIO available on a Raspberry Pi! 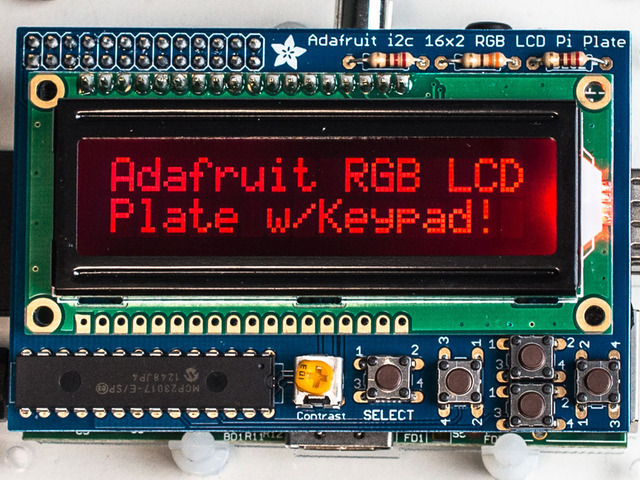 With this in mind, we wanted to make it easier for people to get these LCD into their projects so we devised a Pi plate that lets you control a 16x2 Character LCD, up to 3 backlight pins AND 5 keypad pins using only the two I2C pins on the Pi! The best part is you don't really lose those two pins either, since you can stick i2c-based sensors, RTCs, etc and have them share the I2C bus. This is a super slick way to add a display without all the wiring hassle. WARNING: The new Raspberry Pi model B+ with 4 USB ports overlaps closely with backlight resistor leads on the char LCD plate. You will need to cover the USB port and back of resistors with electrical tape to protect them from touching. See more details and pictures on the assembly page of this guide. This plate is perfect for when you want to build a stand-alone project with its own user interface. The 4 directional buttons plus select button allows basic control without having to attach a bulky computer. 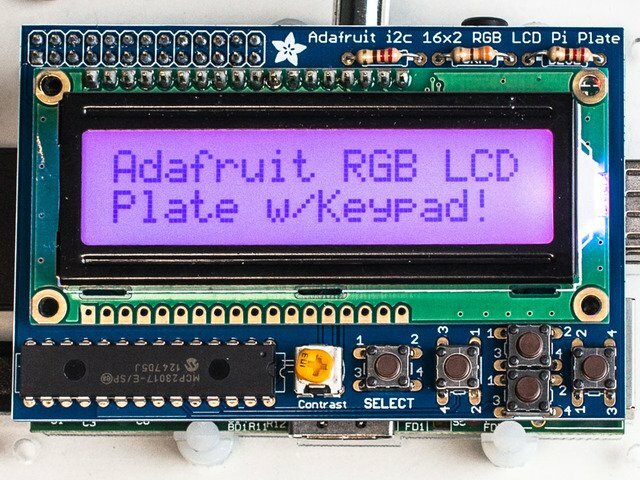 The kit is designed for any Raspberry Pi - version 1 and 2. 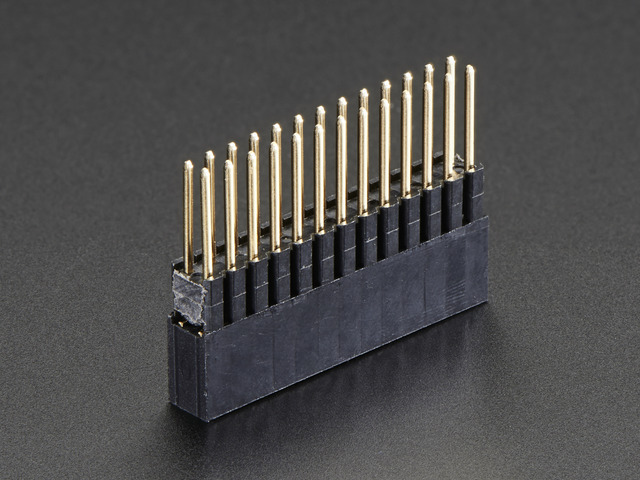 If you want plug in a Cobbler or Gertboard at the same time, check out our Stacking Header, you can fit an IDC cable over it if the Plate is assembled with this part. This guide was first published on Nov 21, 2012. It was last updated on Nov 21, 2012. This page (Overview) was last updated on Apr 22, 2019.